Faruq, an entrepreneur living in Al Kharid, has brought a variety of new decision making devices to RuneScape! Whether you're holding a race, a scavenger hunt, or just trying to decide on what to do, this is the guy that'll make it fair. This feature is available for both freeplayers and members. Faruq can be found in Al Kharid northeast of the silk trader and east of the Gnome glider. Just take the road near the glider south. 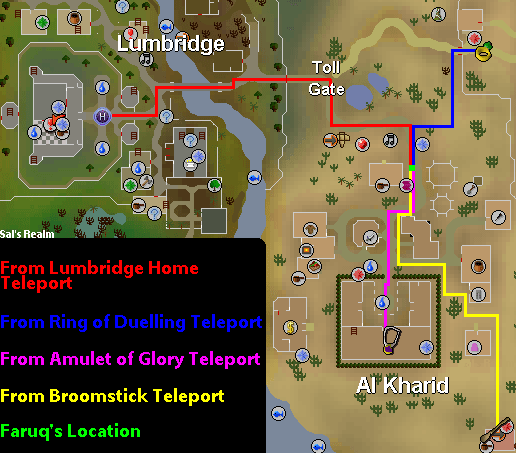 The four best ways to get to Faruq are: Lumbridge home teleport, Amulet of Glory teleport, Ring of Duelling teleport, or by gnome glider. If you have completed the Swept Away holiday quest, you can use the broomstick to teleport to the Sorceress' Garden, then walk north. 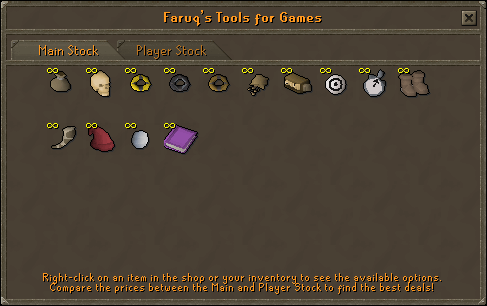 Faruq's items can keep track of time, mark out places or routes, decide things randomly, or even hold clan votes. There is a book he sells called "Faruq's Toolonomicon". This can be bought for 1 gp and will explain how all of the devices work. Dice 10gp Contains many different types of sided dice. It can be rolled in your clan to decide upon things. You must put them away before you bank it. This is used for deciding things fairly amongst your clan. Magic Skullball - Suggests what to do or recommends colors. It can switch a type of answer, give you an answer, or give an answer to your clan. This needs to be reset before entering your bank. Ring of Seeking (hide) 25gp Alerts you when the seeking ring held by your opposing clan mate is nearby. Used for playing hide and seek. Ring of Seeking (seek) 25gp Alerts you when the hiding ring held by your opposing clan mate is nearby. You will not be told who has it or exactly how far away that person is. Ring of Seeking (both) 25gp Works for both hiders and seekers. Marker Seeds 65gp Plant these seeds to mark places to point the way. Captains or clan owners may remove these. They must be a certain distance apart and can't be grown too frequently by the same clan. After 5 minutes, the plant will disappear. They can be used in a race or a game of hide and seek. Empty Bag Caller 14gp Used to prove to your clan that you are wearing no equipment and that you are only carrying the bag. If the member gets new items after they've made their announcement, the first announcement will not have done its purpose. Be sure to check frequently if your clan mates still do not have anything. This is useful for agreeing to fight with no weapons, food, or potions. Timepiece (stopped) 18gp This works just like a stop watch. It counts how long it's been running before it's been stopped. You can restart it, pause it and check the time for yourself and your clan. It must be reset before entering your bank. This can be used to time races, how long it takes you to get a certain amount of xp, or anything else that you can possibly time. Ticker 3gp Can count anything. You can check it yourself or announce the result to your clan. Like the timepiece, it must be reset before you put it in your bank. Racing Boots 20gp Worn by the runners in a race. Starting Horn 45gp Used for announcing the start of races. The starter will blow the horn and a few seconds later, the race will start. Voting Hat 6gp Can be changed between red and blue. Red and blue represent voting options. Have your clan mates wear the hats then use the orb of counting to get the results. Orb of Counting 36gp Used to count the votes represented by the hats. Faruq's Toolonomicon 1gp Gives you information on the devices.